Adapted from Robert Chuckrow, Tai Chi Walking, YMAA Publication Center, Boston, MA, 2002. Alignment refers to the way the axes of the bones line up. Correct alignment is essential for (1) avoiding damaging pressure on the weaker parts of joints and (2) shear stress1 on the ligaments, (3) lowering your susceptibility to acute (sudden) injury, (4) balance, and (5) mobilization of strength. (1) When the bones do not line up properly, compressive stress is placed on the outer parts of the joint where the cartilage is thin and cannot withstand that stress. Over a period of time, the compressive stress can damage the cartilage of the joint and increase the potential for arthritis. (2) Misalignment also places a shear stress on the ligaments, which are bands of fibrous tissue that hold the joint together. Over a period of time, the shear stress can cause chronic pain and weakness. (2) When joints are habitually displaced from their centered alignment, the likelihood of a sprain (stretching or tearing of ligaments resulting from a sudden external stress) is vastly increased. (3) Balance depends on the manner in which the body is supported in stable equilibrium. Equilibrium is most stable when the supporting forces are transmitted along the bones instead of at angles to the bones. Optimal alignment of the bones, therefore, occurs when they line up with the supporting forces. (4) The strength of the body depends on correct alignment. If the alignment is off, when you exert force, the malaligned parts buckle instead of conducting the force along a line. The buckling not only weakens the body but also threatens to harm the body. The result is a limitation of strength. It should be noted that poor alignment requires a dependence upon muscles not designed to support the body. Often, these inappropriately used muscles become over-developed, and the appropriate but unused muscles atrophy. The most common errors in alignment are (1) forcing the knees backward (hyperextending), (2) flattening the arches, and (3) driving the knees inward (pronating). Each of these errors will be described below. Hyperextending the knees. Hyperextend means to extend beyond the natural range of motion. 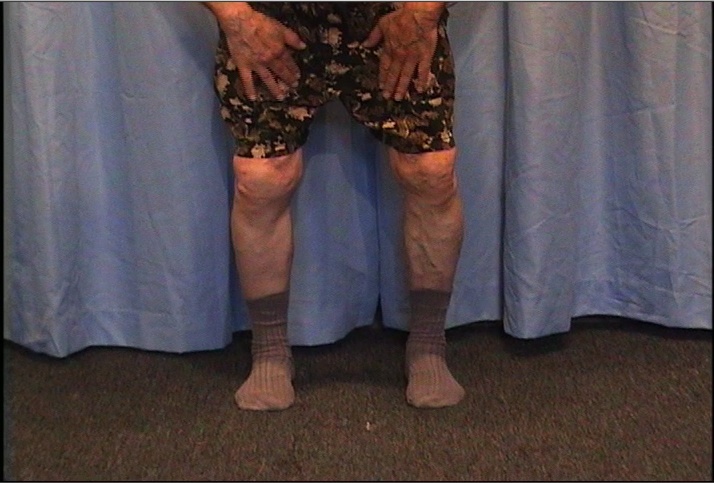 Hyperextended knees and elbows are very commonly seen alignment defects (see Fig. 3-1). One of the most basic concepts of T’ai Chi is not to over-extend any limb or lock any joint. Once a joint is hyperextended, it is locked at the very end of its range of motion, and a little tap can cause injury. Moreover, when a joint of a limb is hyperextended, it loses movement options—a defect when it comes to self-protection. When a knee joint is locked, the above disadvantages certainly apply. However, the knees are subject to most of the weight of the body, and a hyperextended knee experiences a large degree of compression of cartilage at its fragile outer edge rather than on the center, where it is thicker and stronger. The habit of hyperextending knees is relatively easy to eliminate by merely becoming aware of the problem and abstaining from doing it. A number of students who have come to me with chronic knee pain have experienced dramatic relief after a week of merely abstaining from hyperextending their knees. Flattening the arches. Many people habitually flatten their arches so that the weight distribution is incorrectly centered toward the inside of each foot (see Fig. 3-2). The wear pattern on the soles of the author’s shoes in Fig. 3-3 shows the correct distribution of pressure on the soles of his feet. The pressure is mainly distributed over the balls, heels, and outer edges of the feet, with the arches having no pressure at all. Fig. 3-2. Flattened arch. Note the excessive pressure on the first metatarsal and big toe. Note also the degree to which the ankle is off center. Fig. 3-3. 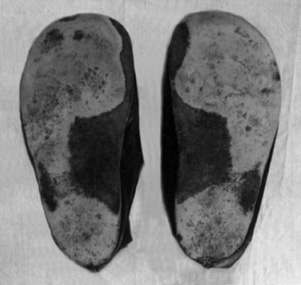 The wear pattern on the soles of the author’s Ute Indian style shoes. He made these shoes without built-in arches. The lighter the region, the greater the wear except for the two dark circles on the sole on the right, where the leather wore through. Pronating the knees. 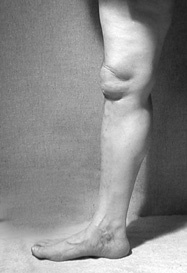 Flattening the arches can cause pronated knees (see Fig. 3-4). 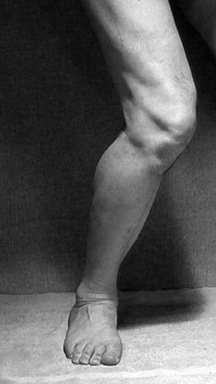 Or, pronating the knees can cause flattened arches. In fact, it is unusual for the knees to be incorrectly aligned if the feet are properly aligned (see Fig. 3-5) and vice versa. However, both misalignments can result from an inward wrapping of the thighs as well as a flattening of the arches. In either case, the condition is always harmful and almost always self-inflicted (habitual). Fig. 3-4. 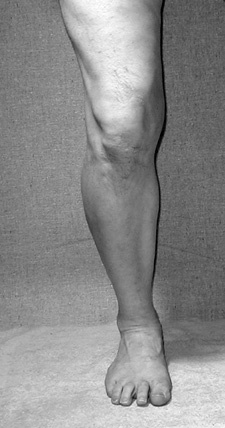 Severely pronated knee. Fig. 3-5. Correctly aligned knee. (i) An inordinately large pressure is exerted on the first (innermost) metatarsal. The metatarsals are the five bones between the toes and instep of each foot. Too much pressure on the first metatarsal can cause it to enlarge, resulting in a painful condition called bunions. 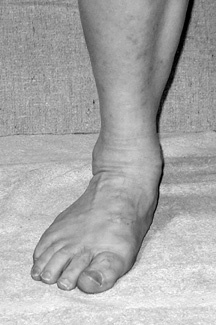 This condition is exacerbated by the rubbing of the flesh over the first metatarsal as the arch collapses with each step. (ii) The ankle joints are displaced from center toward the inside, increasing the likelihood of an ankle sprain. (iii) The knees are displaced inward from their optimal alignment, placing inordinate pressure on the weaker regions of cartilage and straining the ligaments on the insides of the knees. This incorrect alignment greatly increases the vulnerability to sprained knees. (iv) The meniscus of the knee joint can become pinched. This painful condition occurs on the side of the knee opposite to the pronation. (v) The inside muscles of the calf and thigh are called upon to support weight and become over-developed. The muscles on the other side tend to be underdeveloped. Shoes. Babies are born without arches, which form later on. 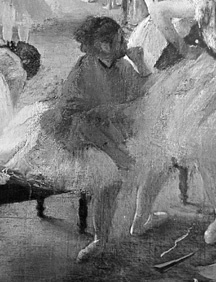 When small children whose arches have not yet formed are given shoes to wear, they are forced to rest what will eventually become the arches of their feet on the built-in arches of the shoes. Also, children angle their feet out to reduce the pressure. It is possible for this experience to lead to a life-long dependence on built-in arches and a habit of angling feet outward. Heels on shoes lift the backs of the legs, causing the body to tilt forward (see Fig. 3-6). To compensate, the top of the body must lean backward, thus accentuating the lumbar curve of the spine (“swayback”). More will be said about footwear in Chapter 9. Fig. 3-7. The effect of heels on shoes. Note how the pelvis is thrust forward, causing the curve of the lower back to be accentuated. Copying others. Children learn by observing and copying those around them, especially their parents. Unfortunately, children do not always realize that some things others do should not be copied. Children who copy parents or other adults with bad alignment can spend the rest of their lives with ways of moving that can eventually become crippling. For example, even if women do not wear high-heeled shoes, as youngsters, they saw and may have copied adult women whose posture was adversely affected by wearing high-heeled shoes. Societal programming. If you observe people, you will find that many stand with their right feet angled out. Because we live in a right-handed society, people tend to over-emphasize their right sides. Also, young females are taught not to bring their knees apart in public, because of its undesirable sexual connotation. This taboo may explain why women tend to pronate more than men. Effect of being overweight. I have found that those with fallen arches who are overweight find it almost impossible to sustain proper foot alignment. The strength required to maintain the integrity of the arches increases with the extra weight on the feet. Moreover, the stress on misaligned joints and its resulting harm is substantially increased by being overweight. A person with “fallen arches“ or “swayback” and whose relatives are “all the same way“ may be reluctant to accept that this problem may result from copying one or both parents’ manner of walking and standing. The expression “it runs in my family” too often becomes a barrier to taking responsibility for self-inflicted problems. It is quite common for many ailments to be blamed on heredity. Of course, heredity determines certain weaknesses, limitations, and the inherent potential functioning or lack of functioning of every cell in our body. However, “fallen arches” and other alignment problems are almost always self-inflicted and capable of being reversed. The first step in changing any habit is a recognition that the old way feels natural and a new way feels alien. As you try a new way for a sufficient period of time, your body will begin to know which way is correct. If your mind is open and you are receptive, it will not take long to change for the better. The beauty of this approach is that you will attain true knowledge rather than blindly following others or being a slave to habit. Also, you will be empowered instead of dependent. Physiotherapists and books on biomechanics tend to view malalignment as resulting from an imbalance of strength and/or length of the muscles involved. Therapy usually involves strengthening some muscles and stretching others. It is often erroneously assumed that the strength/length imbalance is the cause of the problem and not the result. Sometimes orthotics are prescribed, which force the alignment to be more correct. Treating the root of a problem is always preferable to and more productive than treating its symptoms. It is easier for us to blame strength of muscles, genes, and shape of bones for our problems than to take responsibility for how we use our bodies. Bones are aligned or not, based on muscular action. Our muscles are under our direct conscious control, and their degree of tension in every action reflects our concept of how our bodies should move, our emotions, memories of past emotional and physical traumas, and the particular people whose way of moving we have chosen to emulate. The approach with the greatest success in reversing alignment problems involves your understanding of the physiology of the parts of your body involved, connecting the way you use your body with the resulting harm, experiencing optimal alignment, and reeducating your use of the affected parts. A teacher of mine, Elaine Summers, achieves widespread success in working with people who flatten their arches by employing her system of Kinetic Awareness. First she determines which factors are involved. How people respond to a suggestion of changing their alignment reveals the root of the problem. The problem can be focusing pressure directly in the arches or driving the knees inward. The ankles and the thighs are other possible focuses of inward pressure. The reason for focusing pressure can be psychological or merely having copied a parent or other person when young. One way to experience the correct alignment of your arches and knees is to achieve the correct distribution of your weight on your feet, which is the topic of the following section. The distribution of weight on a foot should be centered on the center of that foot. This relationship needs to be satisfied for any weight distribution between your two feet. For example, in a 70-30 position (70% on the forward foot and 30% on the rear foot), 70% of your weight is distributed on your forward foot in such a manner that the center of that distribution is located at the center of that foot. A corresponding statement applies to your rear foot. The following exercise, taught to me by Chin Fan-siong, is useful in locating the centers of your feet: Stand with both feet parallel and comfortably apart, and rock forward and backward. The amplitude of the motion should always be large enough to feel that the center of your weight distribution is alternately forward of and behind what you feel to be the center of your foot. As your sensitivity increases, continually reduce the amplitude of the excursions until you stop at center. If you do this exercise frequently and mindfully, you will eventually know where the center of your foot is in the forward and rear direction. To find the lateral center of your foot, again stand with the feet parallel. Now alternately bring the knees inward and outward, feeling how the weight shifts from the insides of your feet to the outsides. Again, reduce the excursions until you feel your weight centered on the center lines of the feet. It is good to alternate the forward and lateral exercises. Do not be surprised if, at first, the centered alignment feels strange. This reaction always accompanies a correction to habitual wrong alignment. Eventually, your body will know and tell you which alignment is valid. Here is another exercise for improving your awareness of the centers of the feet: Stand with the feet parallel and a comfortable width apart (centers of feet about one-half a pelvis width apart). Try to attain the optimal alignment of the feet, as just discussed. Bend your knees, and move them in a horizontal circle without moving your feet. Notice that your tibias (shin bones) describe cones with vertices at the ankle joints. Sense the points of the feet below these vertices. 1Shear stress occurs when two opposite, slightly displaced forces are applied, as in a pair of scissors.